1. The right upper quadrant was the most commonly positive view, and the caudal tip of the liver was the most commonly positive sub-quadrant for free intraperitoneal fluid. 2. Splenodiaphragmatic space was the most commonly positive in the LUQ. 3. Lateral to bladder and posterior to uterus were the most commonly positive in the pelvic views. 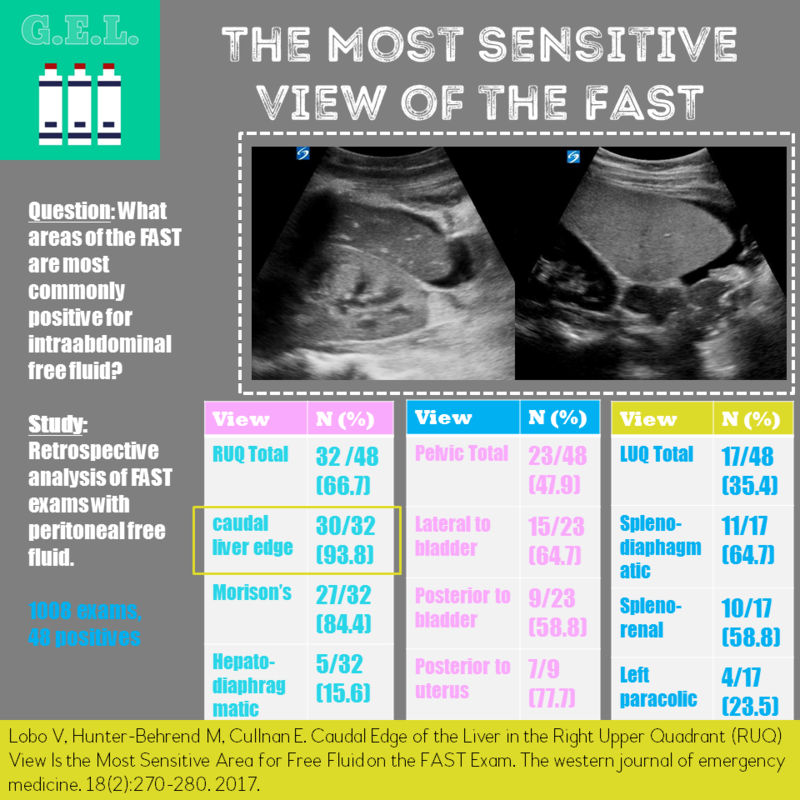 The FAST (focused assessment with sonography in trauma) is a combo of ultrasound views designed to look for free fluid in the abdomen and around the heart in a trauma patient. Traditional teaching (confirmed in prior studies) is that intraperitoneal free fluid goes first to the right upper quadrant (RUQ) and pelvis in the supine trauma patient. However, there is multiple spaces for the fluid to collect within each of the three abdominal views. It can be helpful to know which areas of the abdomen are most commonly positive when there is intraabdominal free fluid (in trauma, presumed to be blood from an injury). To date, there has not been much study regarding which part of the views are the most sensitive. 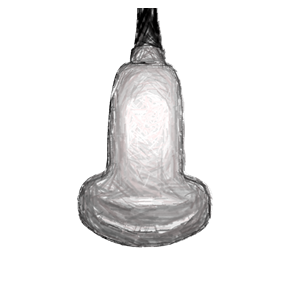 What areas of the right upper quadrant (RUQ), left upper quadrant (LUQ), and suprapubic (also known as pelvic) areas most commonly have free fluid in a positive (abdominal) FAST exam? Positive defined as any free fluid within the peritoneum seen on ultrasound. Compared with CT performed directly after ultrasound or an operative report. Patients with +free fluid then either received CT imaging or went straight to operating room - based on discretion of treating physicians at that time. Reviewers looked at these exams retrospectively and determined if there was free fluid present. Then chart review performed to determine if the cases with free fluid had confirmed intraperitoneal fluid either on CT or based on operative report. RUQ was most commonly positive. Caudal tip of the liver was most commonly positive within the right upper quadrant. Note - multiple quadrants were positive in the same exam (hence totals add up to >100%). Splenorenal was most commonly positive in LUQ - the tried and true teaching was confirmed in this study. In the suprapubic/pelvic views lateral to the bladder was most commonly positive overall, but in females, posterior to the uterus was the most common. RUQ3 (caudal tip of liver) was always positive when RUQ2 (Morison’s pouch) was positive. Does most commonly positive mean most sensitive? Sensitivity means true positives divided by (true positives + false negatives). We don’t know the false negatives in this case. However, maybe the reasoning is that if it is most commonly positive, it is least likely to be falsely negative and therefore could be said to be the most sensitive? Maybe just semantics? Hmmmm. What did we miss by excluding poor quality or incomplete images? It was about 9% of their exams in this case. Maybe the incomplete exams were incomplete because they saw free fluid in Morison’s pouch and therefore did not feel the need to view caudal liver? That would change up the numbers a bit, although unlikely to change the overall point. Does it change practice? Maybe it will change your teaching. This is important information, but you should still get all the views - now you just know where it may be most likely to be.